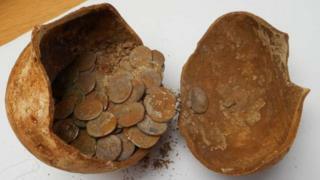 A hoard of Roman coins discovered in Warwickshire will stay in the county after a fundraising target was reached. The local museum service raised £62,000 to buy the coins through grants and donations from supporters all over the world. The 440 silver denarii coins - some of them extremely rare - were uncovered during a 2015 dig at Edge Hill. Warwickshire County Council plans to display them at Market Hall Museum in Warwick in the summer. The haul, found in a ceramic pot under the floor of a building, contains the largest collection of Roman civil war-era coins ever found, museum bosses said. Seventy-eight of the coins date back to a turbulent period when there were four successive Roman rulers in a short span of time. Emperors Galba, Otho, Vitellius and Vespasian each struck their own coins to fund their armies. The coins have been with the British Museum for formal identification and valuation. "We would like to thank everyone who has contributed to bringing the hoard home," said Sara Wear, from Warwickshire County Council Museum Service.